Master artist Linda Miller returns to the SCC with rosemaling telemark or gubrandsdale style! We welcome back Linda Miller for spring 2019! This class will be about painting on a curved surface of bowl, with rosemaling in the Telemark or Gubrandsdale style with master artist Linda Miller. You will be using the colors used in the time period of 1750-1850. Suggested pattern will be available for the students. However, students are encouraged to paint their own design with teacher’s suggestion. Background paint will be supplied. Brushes and palette knives will be offered for sale. The project will be an 8” Nordic basswood bowl to be bought from teacher. A list of student’s supplies will be sent upon registration. To register a $50.00 deposit is required to hold a place for you. The Kaffestugan (Scandinavian Cafe) will be open Saturday, from 11-3, for open faced sandwiches and pastries, but please bring a lunch and water for other days. 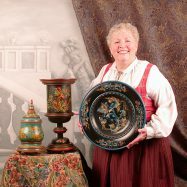 ABOUT LINDA: Linda Miller has taught rosemaling at Fletcher Farm in Vermont, John Campbell School in North Carolina, Vesterheim Museum in Iowa and several different Sons of Norway lodges on the east coast, and adult education classes in her area.